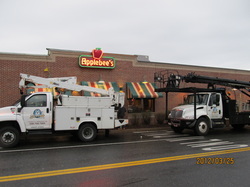 When Applebees decided to makeover all of their northeast restaurants they needed to put together a reliable team of contractors to handle the variety of tasks required. The requirements were detailed and the deadlines nearly impossible. Each restaurant would close on Sunday and would get a complete interior and exterior makeover in just 3 days allowing the restaurant to reopen on Wednesday. There was no room for failure or delays. 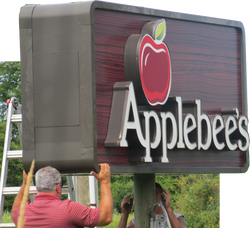 The makeover included installation of all new window awnings, entry graphics, new Applebee's exterior logos and in some locations, a whole new roof panel set. We signed on to handle graphics installation for a few of the restaurants scattered around New England. Our team of experienced sign, graphics, and awning installers began the first installation on SuperBowl Sunday. We provided a quick, efficient, detailed installation while working closely with the coordinators on site, the code enforcement authorities, and the material vendors. Our team was able to seamlessly handle the workflow in unison with the other subcontractors on site. Our quality, experience and efficiency proved itself at that first location and we were offered an opportunity to do as many locations as we wanted. Over the next few months we completed over 30 successful restaurant upgrades. We are proud to have been a part of this upgrade plan and are pleased to know that these restaurants showed an average increase of 12 to 15 percent after the upgrades. The true value of advertising is difficult to measure but clearly Applebees recognizes that value and Serrato is here to help your organization reach its full potential also. Our clients have trusted the Serrato team for decades and you can too. Call us today for all of your graphics, awning, and sign needs. We have a team of dedicated people ready to handle your project, large or small, we’re here for you.